Toms Sale is now on with up to 50% off all footwear! Distinctive, casual and oh-so-comfortable, Toms has become a byword for cool footwear, beloved by the young and the young in outlook. The company is best known for its instantly recognisable alpargata or espadrille style canvas shoes, although it now offers a range of different styles in a thrillingly diverse choice of colours. Toms is more than just another trendy footwear range, however. Their ethical policy shines through, and the company generously also donates shoes to impoverished children. Cool new shoes AND the chance to give a helping hand to kids in need? Funky, fashion forward footwear never felt so good! Add Toms to your Favourites list and be the first to know every time they have a Sale on! 1st January 2018 - Toms New Years Day sales for 2018. 7th May 2018 - Toms Early May Bank Holiday sales for 2018, add to your diary now! July 2018 - Toms Summer 2018 sales, joining us? 23rd November 2018 - Toms Black Friday sales in 2018 start on Friday 24th November. 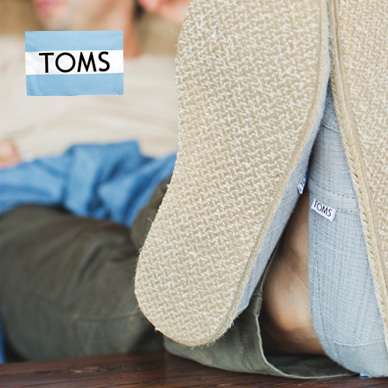 Add products from Toms to your Love Sales list. Get the Love Sales button now! Toms January Sale is now on with up to 50% off all footwear! Toms Cyber Monday Event is now on with up to half price savings across all footwear! Toms Black Friday Event is now on with up to half price savings across all footwear!